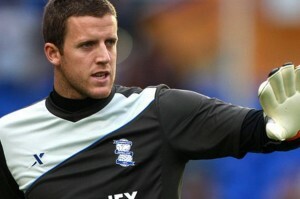 ← Do Birmingham City fans dare to dream? So, the summer overhaul begins. Gary Rowett has set the wheels in motion for a summer of change by revealing several first team players will not be getting new contracts. Of these players, Colin Doyle will be sadly missed as his 14 year spell at St. Andrew’s comes to an end. Doyle will be missed – not so much for his contribution on the pitch, after all, he has only clocked up 63 appearances for Blues since his first team debut in 2006. But the Cork-born goalkeeper has been a terrific servant to the club and has given Blues’ fans some find memories. First there was his penalty save in the dying minutes of Blues’ 3-2 win against Wolves at the Molineux which helped Blues to promotion. And who remembers him saving two Juan Mata spot kicks in an FA Cup tie with Chelsea? And of course, the one which will be remembered with the greatest fondness was his cameo appearance as a centre forward during a pre-season friendly at Shamrock Rovers. It is with a heavy heart that I wish Doyle all the best for his future. Thank you and goodbye, Colin. Also heading for the St. Andrew’s exit door is Olly Lee, Will Packwood, Callum Reilly, Nikola Zigic, Matt Green and Gavin Gunning who have all been released. Rowett also confirmed that youngsters Kamal Guthmy, James Fry, Luke Armstrong, Nat Kelly and Callum Preston would not be getting new contracts and the club are undecided on the future of Amari’i Bell, who has a one year option available on his current deal. This entry was posted in Rob Wildey, Tired and Weary. Bookmark the permalink.